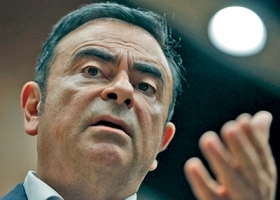 Ghosn: No cheating at Renault. (Bloomberg) -- Renault CEO Carlos Ghosn said regulators need to determine new rules for checking vehicle emissions after probes sparked by Volkswagen Group’s test cheating exposed differences between laboratory results and cars' on-street performance. Readings from day-to-day vehicle use are always "multiples" of figures from testing, and so-called "real driving emissions" aren't yet regulated, Ghosn said in his first remarks since a French government investigation of Renault came to light a week ago. "The question is what's acceptable" to authorities, and "we are hoping that there is going to be a position from the European Commission on that." Volkswagen's admission in September that it rigged diesel engines to pass emissions tests has prompted industrywide investigations. The company has said up to 11 million vehicles worldwide are fitted with manipulated software designed to cheat diesel emissions testing. Renault shares have been under pressure since the search of the carmaker's offices by French fraud investigators became public. The automaker agreed on Monday to recall 15,800 Captur SUVs to adjust pollution-filtering systems, and to offer technology upgrades to about 700,000 customers, after official findings that some vehicles didn't meet environmental standards. "We said from the beginning, there is no cheating, and second, all the norms are being respected," Ghosn said Thursday in an interview with Bloomberg at the World Economic Forum in Davos, Switzerland. Renault rose as much as 5.5 percent, the steepest intraday gain since Nov. 4, and was trading up 3.3 percent at 76.96 euros as of 3:14 p.m. on Thursday in Paris. That pared the stock's decline this year to 17 percent, the fifth-worst performance on the Stoxx 600 Automobiles & Parts index of European manufacturers. "The share price mainly is more about the unknown" regarding investigation results, with a recovery possible "within the next weeks, when all the data will come and confirmation of everything we're saying," Ghosn said. The CEO also said Renault plans a "much more massive" presence in Iran, with a wider range of local partners, when the company returns to the country now that trade sanctions have been eased. Renault will commit to investments once an international legal framework for restoring business ties is in place, Ghosn said. "We're waiting for the light to go from orange to green," he said. The carmaker halted business in Iran three years ago to comply with trade sanctions, resulting in a 514 million-euro ($560 million) provision that hurt earnings. French competitor PSA/Peugeot-Citroen said last year that it was struggling to reach an agreement for a possible return to Iran because of resentment following its departure in 2012.